I’ve been craving for sugary things a lot more lately. I never used to. Savoury was always my option although desserts were welcomed as a post-dinner cleanser or accompaniment to tea and coffee. There were however, more of an eye candy for me. Perhaps it’s because I’ve been mentally and physically drained lately (can you imagine that even though I’m not working full time?) and need the sugars to keep me energetic. Or maybe it was the cold weather that has affected my appetite and various cravings. Whatever it is, you can expect a little more dessert recipes on the blog in the near future perhaps. One of my baking endeavours lately has been choc chip cookies. It’s such a classic and favourite sweet to go with a cup of hot aromatic tea. Even though I say this, I actually used to dislike cookies, but it’s only the hard and dry varieties that I wouldn’t touch. The gooey centred and slightly chewy cookies such as the ones from Mrs Fields is a different story altogether. My father has a strange addiction to eating cookies, even though he doesn’t like sweet things in general. If I ever offered him cakes or chocolates, he would undoubtedly shake his head without a hint of hesitation (unless if it’s not very sweet). So I’m not sure why he loves cookies so much. He would eat them one after one with a cup of tea or coffee and before long, a whole pack of 24 is gone. He’d eat them when he’s feeling peckish, when he’s bored and when he just feels like eating one. However, I don’t think my cookie loving father would actually like eating my choc chip cookies. Odd I know. 3. 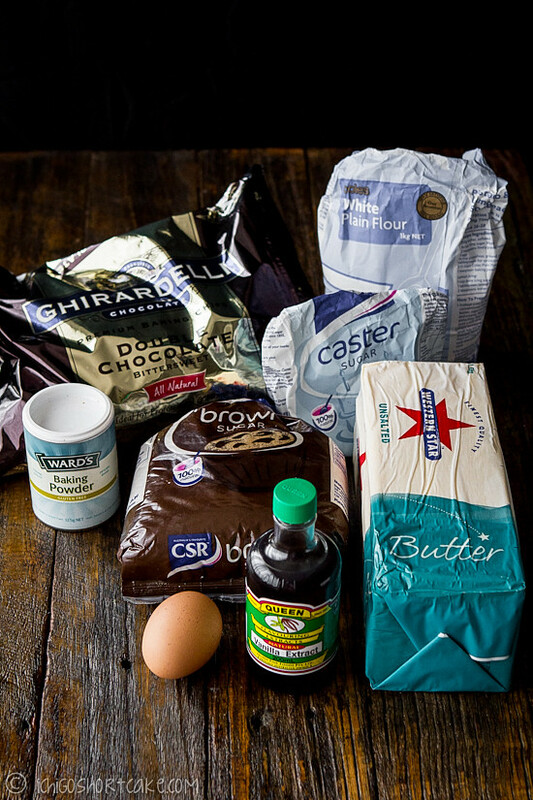 Add in egg, vanilla extract and salt and whisk on low until light and fluffy and completely mixed. 4. Sift flour and baking powder into the bowl and mix until combined. 5. Finally, mix through chocolate chips until roughly evenly spread. 6. Line a baking tray with baking paper, place cookie dough in tablespoon sized balls, roughly 3cms apart from each other. 7. Bake in the oven for roughly 15minutes or until golden, the edges are crispy but the centre is still soft. 8. Cool on the baking tray for 5 minutes, then cook completely on a wire rack. Serve with a cup of milk, tea or coffee. 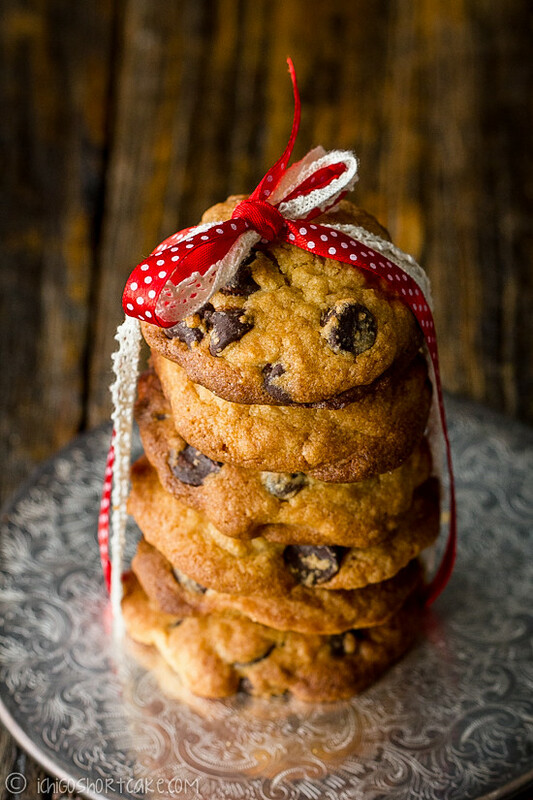 Question time:How do you like your cookies, with a soft centre and gooey or do you like them thin and crunchy? Oh yuuuuuurm! I absolutely love your photos, I have no idea where you find all those beautiful backdrops for them! OMG.. could I order a whole bag for myself please? Yum!!! This is a keeper. My whole family will love this recipe. 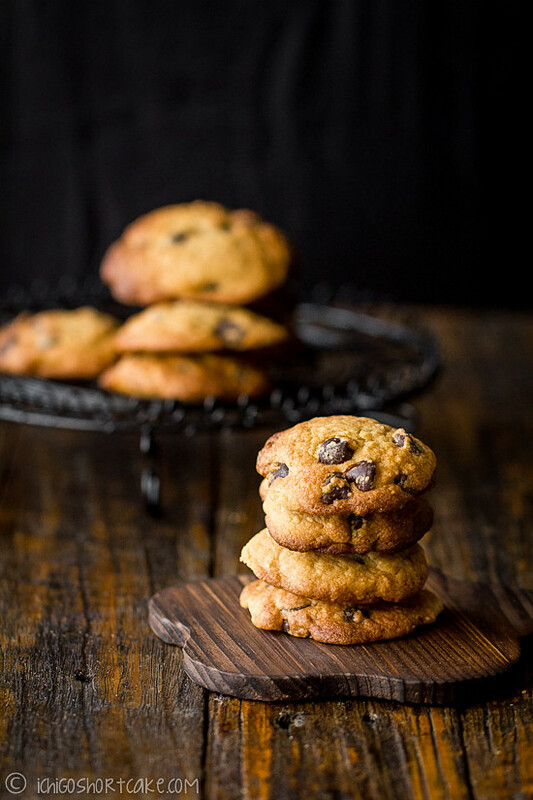 chocolate chip cookies are definitely one of my favourite cookies to eat and make ~ Gotta give this recipe a try! Thanks! Nice recipe, great photos. 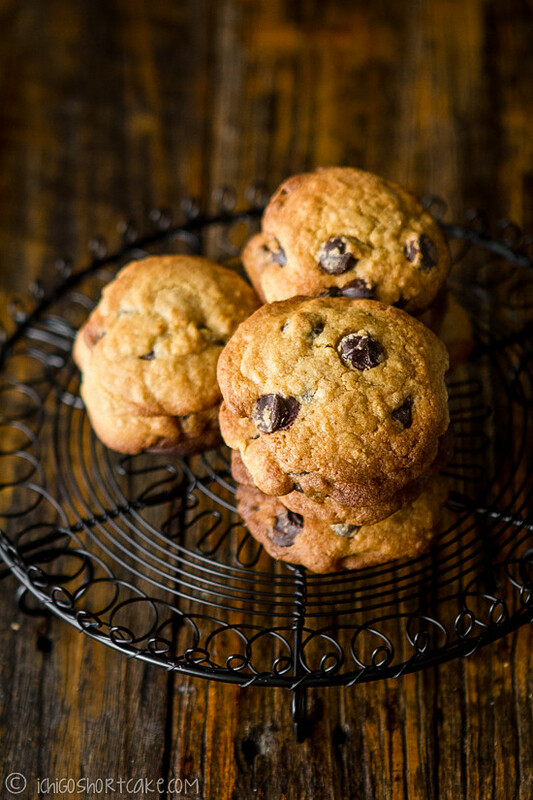 My wife is the baker, and when she makes cookies – always a double batch even thought it’s just the two of us (though we do give some away – we have many leftovers. They actually freeze pretty well – that way you can pull them out in a week or two and have more cookies! What tasty and gorgeous photos! 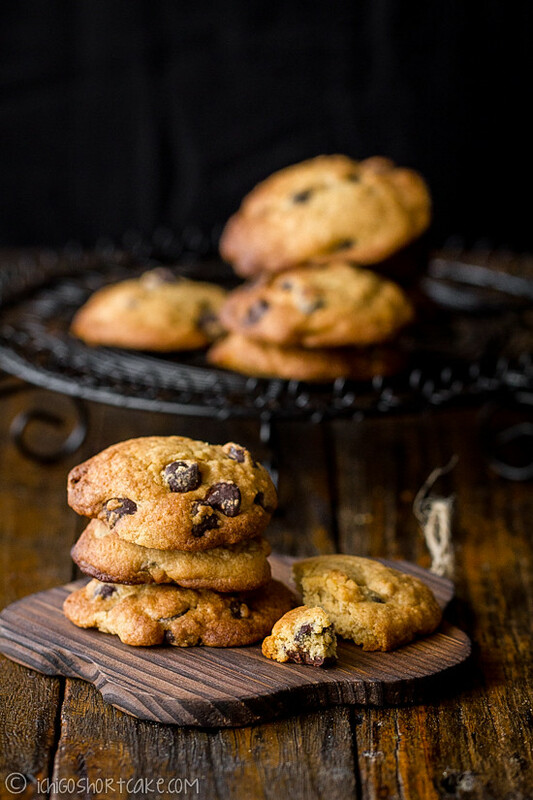 I’m trying your recipe next- I make chocolate chip cookies for my kids once in a while and I’d like to try new recipe and yours look delicious. I loooove the first picture – dark woods, dark background, yet cookies stand out beautifully! Thanks Nami! I like trying out different recipes too, although not sure how this one fares with your other ones. I just realised I’ve been making mistakes with my ingredient photos, in the photo I only put 1 egg, but the recipe requires 2 eggs. 😛 Silly me…. Stunning pictures…came here following the pin by Nami…yum..yum! awww man, nothing beats a chocolate chip cookie! Thinking I’ll have to make some stat after reading this post! Wow these look amazing. I love how you wrapped them up in the red ribbon. Great pictures.